Tuesday Talk-What Do You Do? 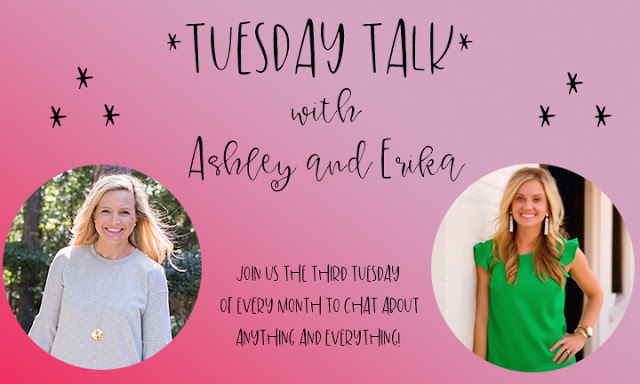 It's Tuesday Talk that day every month when Fancy Ashley and I come together to chit chat about anything and everything! Today, we're talking mom stuff and I'm looking for your opinions. If you saw my post yesterday, we just had Nixon's birthday party over the weekend at a local trampoline place in town. Typically when you have a birthday party outside of the home you have a party attendant or party host who's helping out with making sure things run smoothly for your party. Then at pay time they ask if you'd like to tip your party helper. Let's talk in estimates-if your party is $250, then the location suggests tipping 20%-which is $50. 2. Tip something else-maybe $20? I always wonder WHAT do people do? Do you tip the full 20%? I'm assuming party hosts are getting paid differently than waiters or waitresses but I don't know the answer to that. Anyone know? I'd love for you to let me know what you'd do...1, 2, 3, or 4. And I'm gonna add a little poll to my Insta Stories as well. I'll let you know the overall verdict once the votes are in. Thanks for reading today, friends! I always base it on service. If they do an exceptional job, then I would most certainly give them more than the suggested 20%. I think it definitely depends... we've had some places provide 2 party hosts and no way was I shelling out $100 extra dollars in tip! (we gave them each $25) We've had at least one or two parties that were hosted by the owner and I figured that since it was their business I didn't really need to tip them. But we have had hosts that have gone above and beyond and really made the kids' day... and we might have tipped them a bit more. My daughter is now 14, so it’s been a few years since we did the big birthday parties. I used to give $20 total. At My-Gym(2008-2009), it was two helpers and they just then split it. I have only done one party out in our local zoo. I tipped 100.00 because there was 3 girls and they did the whole party. Um, I had no idea this was even a thing! I'd say it depends on the service, but typically I'd stick to 20%. I've never regretted over-tipping but have regretted under-tipping! I was a birthday party host back in college. 20% is expected. Similar to a waitress, they are assigned to your group and get whatever you need when you need it. I made minimum wage ($11/hr) and depended on tips. I poured soda, cut and served cake, ordered pizza, brought kids back and forth to the bathroom, constantly did headcounts, and made sure everybody is happy. Please don’t be a cheap tipper. There’s a lot of work that goes into a successful party and they should be paid accordingly. I guess I never really put that much thought into it and have always Just tipped 20%. But I’m interested to hear what your poll reveals. I think something along the lines of $25 per host seems appropriate In many cases. Always a minimum of 20%...if they are "extra" then we leave extra! I always give 20% and tip more if the service was above and beyond. We had a baptism dinner for my daughter and our waiter was in charge of our group as well as a section of the restaurant. He was phenomenal and we tipped him $100 on our $250 bill for being amazing! This is always something I wonder and question myself about! Thanks for bringing up the topic Erika...can’t wait to hear what the consensus says. Absolutely, always, no-matter-what tip the suggested minimum. If you really feel like it is undeserved, you need to speak with a manager about why you're not tipping them so they can help the host improve or find someone new for the position. That is the majority of what they're getting paid! If someone goes above and beyond, of course tip them more... but, please, don't tip under unless you explain why you're doing it. #4! Usually tip 20%; however, I have had party helpers that didn't do anything! I still tipped, just not 20%. So it definitely depends on how good they are. If you are leaving a $50 tip and the person is already making $11 (per the example above) on 3 hours of party time. That person is making $27/ hour. I tend to pay/tip in relation to the quality of servicebut to me $27/hour is a bit pricey for a service that doesn’t even require extensive training! At the most I might leave $10-15 / hour if i had good service. If I was paying someone to help me with a party at home (which I’ve done for family birthdays and celebrations), I normally pay somewhere around $15-20/ hour to someone who has had years of housekeeping and hosting experience. Now for waiters- where the norm is 15-20% I do tip that. But there is something to be said for entitlement, when I worked as a college kid I never expected to be paid as much as someone with a college degree! I always wondered that too. I am with others that it depends. I have had parties were the party host has multiple parties and is there to hand out bracelets and help pass out cake. I have also had parties were the party host does the ENTIRE thing. The pick up paint, get more paint, help the girls, do hair. I guess if I am already paying 250 for a party and the party host helps pass out cake and put presents on tray $25.00 is good for two hours. If they are doing working help make the party a success then 50-100 is applicable. I saw a VIP party with Pary Host for 2 hours, be $525, the regular party with no host was 325. If I am paying an extra $200 an hour for the party host (Plus a few other things, but atleast $100 was for the party host) I don't think its appropriate for the party to now expect an additional 105.00 or more for a tip for 2 hours. Sometimes I feel tipping is out of hand. If they pay the teenager 11/hr and ask for time to supplement, I would rather up there fees, pay the teenager 15 & 17/hr and have me not worry about. I agree with Kimberly above. I take into consideration their hourly wage and training to make that wage. (I thought minimum wage is somewhere around $8.00??) I also understand that many people who are tipped do not have benefits, or paid days off. Bottom line for me...tip 20% unless service is severely lacking. If a job well done, tip more. My sister works at an urban air as a party host and is paid a “lower” hourly wage because they expect her to get tips. I definitely think you should base the amount on the service but I do feel that unless the party host was not attentive or did not do their job, 20% is the minimum I would suggest. Of course extra great service should be rewarded as well. Oh my gosh ALWAYS tip at least 20%! I always tip 25% and if the service isn’t great, then 20%. Many servers make under minimum wage to compensate for tipping. Someone had great advice here, if there’s a problem don’t take it out on their paycheck, speak to a manager. Number 1. I figure that the workers are not making much and need every dime they can get. I live in the San Francisco Bay Area where people with good jobs (teachers, nurses, poilcemen,etc) can barely afford to live here. Just me. I certainly don't have an opinion based on experience, I've only had 1 party at a children's place and I paid online and did not tip the day of. I did not know this was a thing. I don't understand it, why would they be getting paid extra for just doing their job? We live in Suh an "entitled" world anymore. If they are already getting paid by the company they work for, why would they get more money for doing what they were hired to do? ?